This research point is to visit an exhibition of contemporary textiles. Due to the remoteness of my location (classified by the Australian Bureau of Statistics as “Very Remote Australia”) this has not proved an easy task which is why I have not been able to complete it before now. I was fortunate to have a few days in Singapore recently so I took the opportunity to visit the Art Science Museum to look at their Singapore Eye exhibition. It was not a textiles only exhibition but did include some textile based exhibits and others that I thought were quite inspiring for future textiles work so it was as good as I could get. The exhibition’s theme was the celebration of Singapore’s contemporary art for the nation’s 50th anniversary. The works were well displayed with plenty of room between each item for viewing but the signage could have been better as a couple of exhibits were positioned in dark rooms and it was easy to miss these. The general lighting was good with natural lighting from a central well and artificial lighting aimed at each piece of work. I was allowed to take non-flash photographs. Each exhibit was clearly labelled with the artist’s details and the concept behind the artwork which made for interesting reading; shorter versions of the same information were also available in a leaflet. The exhibition was visually stimulating and interesting in parts, with a number of pieces that, in my opinion, lacked the ability to grab the viewer’s attention. 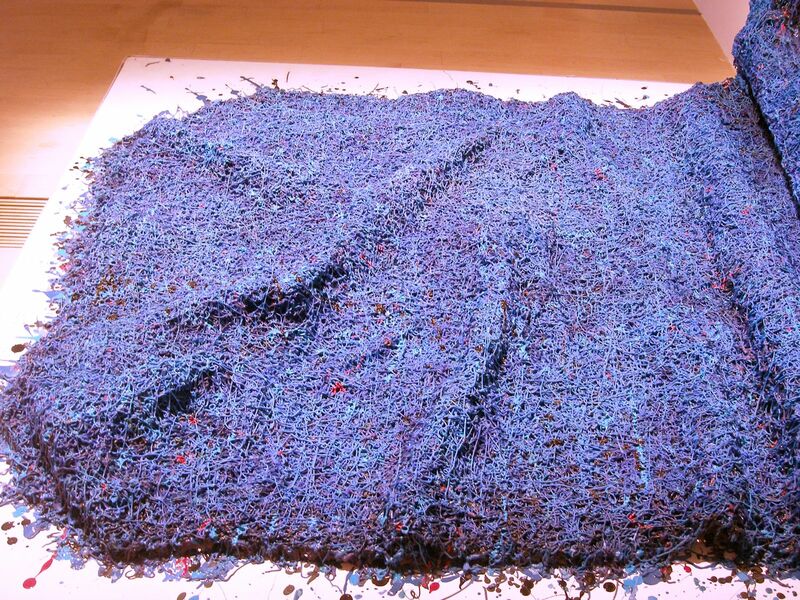 Some of the items were interesting and could have stimulated the debate of what is art – for example the piece below by Jane Lee in which I struggle to see the art. I can appreciate the colour and the shape but is this enough to make me call this art? 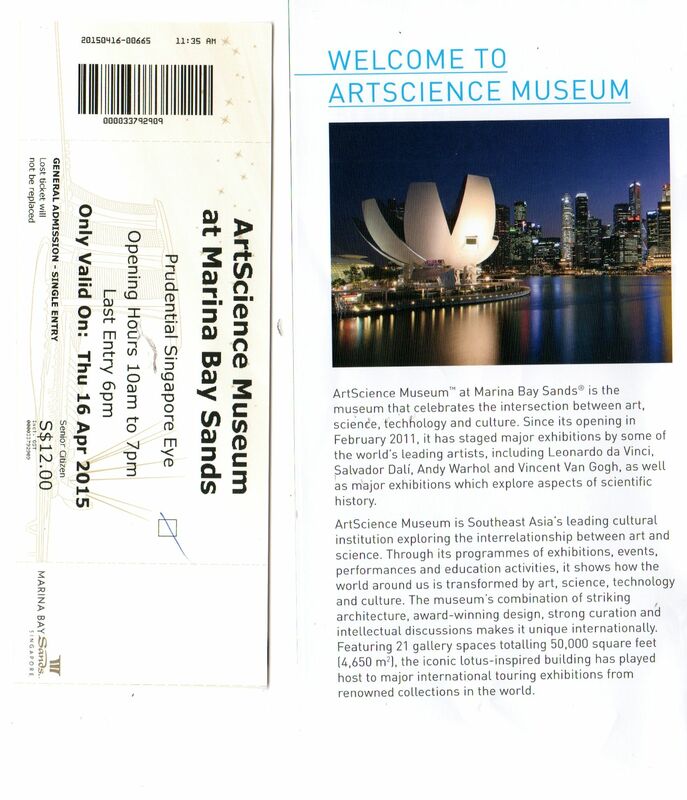 Image from Art Science Museum. On the other hand, I really liked the second piece by Jane Lee called Beyond the Blue. 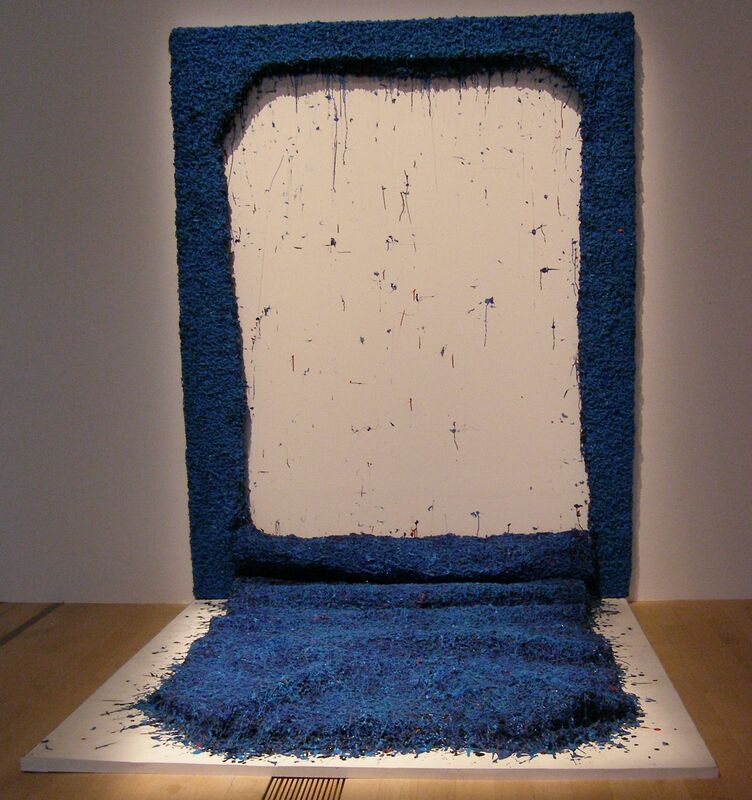 The description of this is “a sculpted mass of extruded paint cascades down the wall and collapses onto itself”. 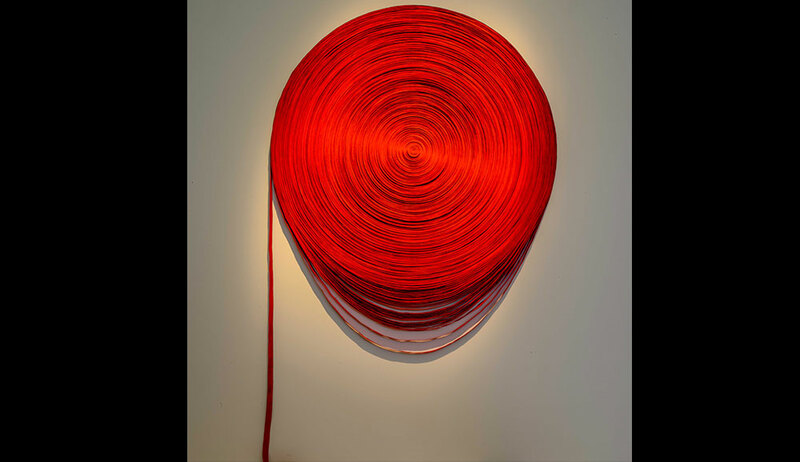 This is a large piece, 2.5m x 1.9m x 2m. Jane’s approach is to explore the nature of the components of a painting, in this case the paint itself. The paint flows onto a pallet at its base, taking the painting off the wall and into the realm of sculpture. There are a number of aspects of this artwork that appeal to me. The colour as blue is one of my favourites and this isn’t just the dark blue that jumps out, it is full of flecks of other shades of blue along with splashes of red, yellow and other paint colours. This mixture of colours gives it life which is added to by the textures of the paint strands and the way they interweave and mass on top of each other. The artwork has so much movement in the paint itself and in the way the centre has collapsed from the wall and undulates over the pallet. It is like the painting is trying to escape the boundaries of its own frame and take on a life of its own. I had a look for interviews with Jane Lee to find out about her approach and the most insightful was from The Online Citizen although it is a few years old (2009). The most interesting aspect that stood out in this interview for me is Jane’s spontaneous approach to painting; allowing the works to unfold perhaps in a different direction to originally intended. I also like the artwork Terra Sensa by Jeremy Sharma. 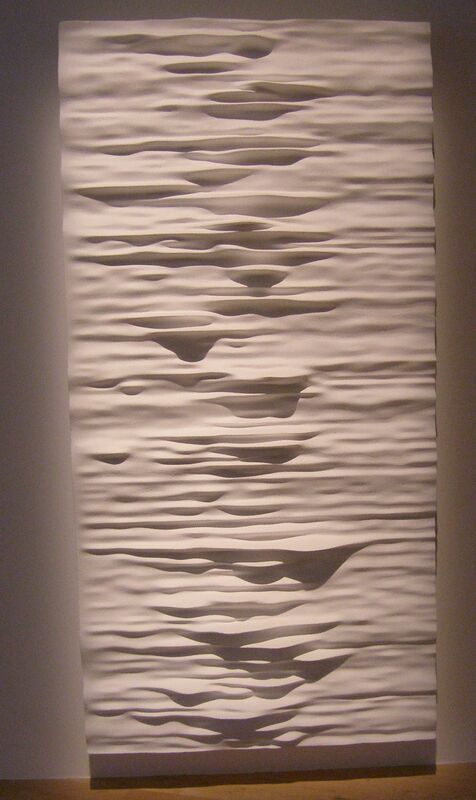 This work is based on the data from radiographs of pulsars that he has plotted on a 3 dimensional grid and then converted into an artwork of ridges, peaks and valleys using high density polyurethane foam. As I am about to start the third part of ACA which covers manipulating fabric I immediately saw the potential for the idea behind this artwork to be used to create work in fabric. I really like the simplicity of the piece with the single colour but so much interest created with the varying terrain. This work benefits from good lighting which really shows up the shadows in the valleys and emphasises the high points. 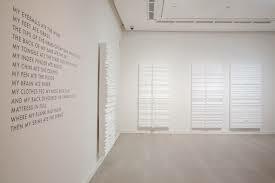 When investigating Jeremy’s work I discovered that the piece in the Singapore Eye exhibition was actually only one part of his Terra Sensa work which was a series of four pieces made for the Singapore Biennial in 2013. It is a shame that only one of the pieces was on display in the exhibition I saw as they have much more impact as a group. 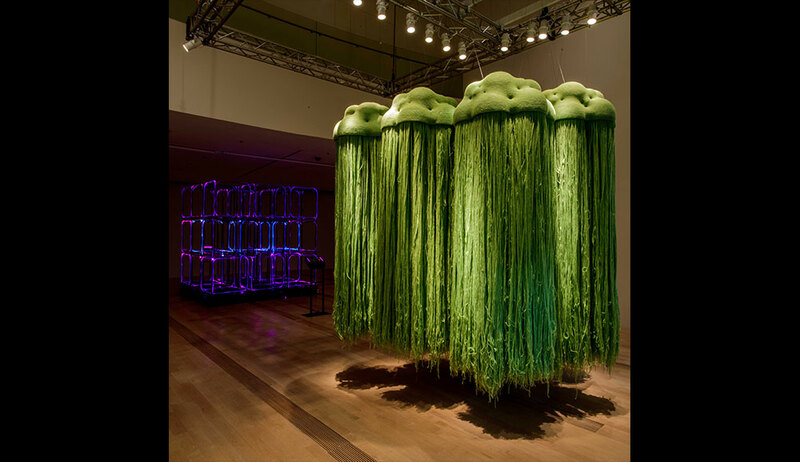 The main artwork that screamed textile at me at this exhibition was A Secret Garden by Yeo Chee Kiong which uses wool to depict a rainforest. What thrilled me about this was that I have often spoken about wanting to do a tactile artwork that hangs from a ceiling enabling people to walk through it and encouraging touch, something that I feel is missing from many exhibitions (for very understandable reasons). I feel that textile work cries out to be touched by the visitor and particularly by anyone with a visual impairment where the sense of touch is so important. Although small in diameter, A Secret Garden was very dense and surprisingly easy to get completely disoriented when inside it. Again, doing some basic research into Yeo Chee Kiong revealed that this was originally part of a larger art work which included video art, taking the art form across genres and melding art disciplines. The other piece I liked enough to photograph 3 dimensional layers of mixed media on wood called Architecture of Desire by Choy Chun Wei. Looking at Architecture of Desire I actually didn’t identify the message even though I tried to pick out some of the words used to see if I could soak up the meaning. 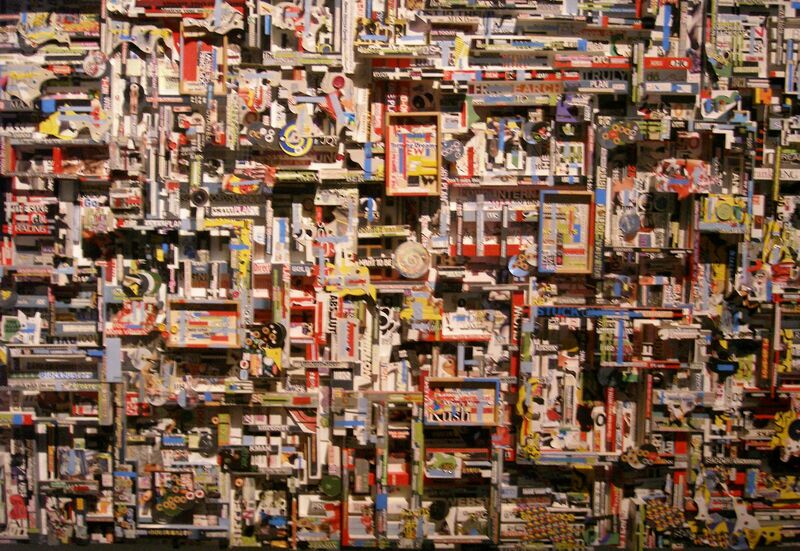 In the end I liked the piece for its physical depth, the multiple layers, the use of mundane materials (magazines) and the colour composition.